A copy of this book was provided for free and the review and opinions are mine alone. So, Becky and Doug offered me the opportunity of a first read of a new collection of short mysteries and, of course, I couldn’t refuse. The author lives here is Columbia and Holland House Books has published two of her earlier books, The Absent Woman and Rebecca’s Road, which have been well received. However, Scoville is Ms. Lee’s first venture into the mystery genre. The volume contains three short stories: Three Blind Mice is the tale of a mysterious disappearance; murder most foul is the core of Always on Thursdays; and the kidnapping of a child is central to Recesses of the Mind, but the plot of each is driven by loving relationships gone sideways. Ms. Lee has taken an interesting turn on the familiar small town locale familiar in traditional cozy mysteries by placing her tales in Brooks Beach, Oregon, and introducing the reader to Humboldt and Maggie Denton. Brooks Beach is not the usual upscale, often touristy locale so familiar now, nor are the Dentons, a retired couple, the expected upscale, often intellectual and always tasteful protagonists who reside in such well groomed small towns. Brooks Beach has some grit and the Knotty Pine Tavern is the town watering hole-providing pool, shuffle board and illegal black jack in the back room. Maggie Denton is a strong woman, the necessary counterweight to her husband, Humboldt Denton. 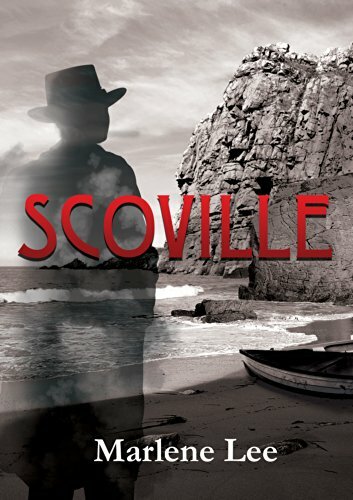 The title character, Scoville, is the town sheriff, who appears only briefly in the first two stories but whose laconic and often cerebral approach always cuts through the traditional red herrings to solve the crime. Stylistically the writing is always good and often much better than good. The author enjoys giving her readers short but resonant descriptions, instance on a dark and stormy night (what else): “Down at the harbor the voice of the disinterested for horn alternated with the wash of surf, systolic and diastolic pulse of Brooks Beach.”. Her characters, not only the Dentons and Scoville, but the court reporter married to the town philanderer and Eppie Epperson who deals black jack every night at the Knotty Pine hold the reader’s interest for their very familiar qualities while suggesting of a darker back story. I really hope that Ms. Lee will find the time to write a book about Brooks Beach and it’s residents. She has created a wonderful twist on the traditions of the cozy mystery with the darker, less than tidy lives of her characters and the town, especially the Knotty Pine Tavern. Both characters and location are appealing in these short stories, but I think they could be a great deal more given a larger stage on which to act. Be sure to drop by the store and see Columbia’s very own Marlene Lee on August 23rd from noon to 2p.